Professor M G S Narayanan is a well-respected historian, academician and political commentator in Kerala. 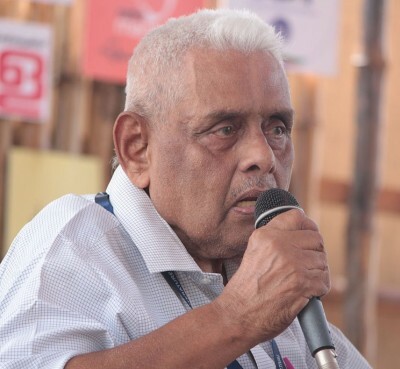 He was he head of the department of history at Calicut University, and also served as the first member secretary of the Indian Council of Historical Research and later as its chairman. "I have not seen such chaos and confusion before. This is for the first time that it has reached such proportions," Professor Narayananan, below, tells Rediff.com's Shobha Warrier. Recently, you commented that Pinarayi Vijayan could perhaps be the last Communist chief minister in India. What made you say that? What was happening in Sabarimala, the issue of whether women in the age group of 10 to 50 should enter the shrine or not, was taking an ugly turn. It has created utter confusion in the state. I felt it might even lead to a lack of balance in Kerala politics. I am not saying this with certainty. But there is a possibility that it may bring down the popularity of the Marxists, and there may not be another chance for the Marxists to rule Kerala. Do you think the believers in Kerala are unhappy with the way the Left Democratic Front government handled the Sabarimala issue? We do not know who is a believer and who is not. I see political agenda in the so-called believers also. Earlier, we could describe or identify a person with certainty, but today, people change colours all the time. Sabarimala did not attract so many people till the middle of the 20th century. Very few people went or trekked to Sabarimala till then. Sabarimala Ayyappan was just another Ayyappan and there are so many Ayyapan temples in Kerala. It is true that local people go to the local Ayyappan temple and worship him. 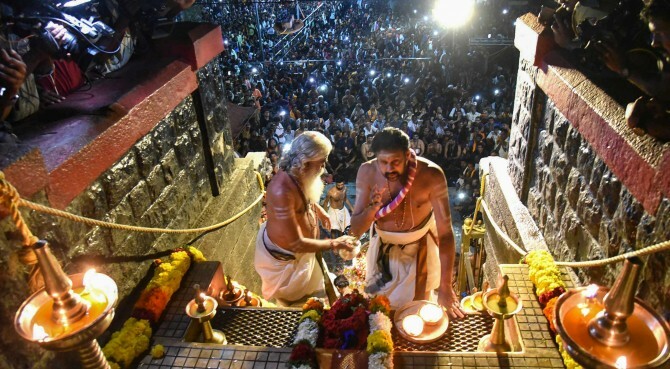 Sabarimala gained prominence or special significance only in the second half of the 20th century when some Christians burnt the temple and planted a cross there. They claimed that the cross had been there from the first century and connected it to St Thomas. The fact is it doesn't match the calendar we are following. This created a commotion and attracted people's attention. It was after the burning incident that people in large numbers started going to Sabarimala. The recent confusion started with the Supreme Court order. Should courts be deciding the traditions and rituals followed in a temple or should it be left to the temple? Normally, it should be left to the temple. But in this case, somebody went to court. So, the court took a position and made a judgment. When the court delivers a judgment, the government has to follow it. It is true that the government took an improper haste in implementing the order. It could also be because of the pressure created by the circumstances. I feel the media is waiting to sensationalise every issue. The situation boiled to this position mainly because of that. Now, it is very difficult to go back to normalcy. Some time back, there was not much empathy for communal sentiments or traditions in Kerala. The situation is totally different now. The forces which were not so powerful earlier are getting more powerful now. You mean the Bharatiya Janata Party? You see the BJP on one side and the Marxists on the other side. I see this kind of a division in society today and it has created a crisis. I do not know what will emerge out of this. I have not seen such chaos and confusion before. This is for the first time that it has reached such proportions. You see the BJP and forces like Rashtriya Swayamsevak Sangh on one side and the Communists and to some extent, the Congress on the other side. This kind of confrontation will lead to utter confusion in society and common people will be forced to take sides. Who will benefit from this division caused by the Sabarimala issue? The Congress or the BJP? The Congress is not a force in Kerala like it was before. The Communists are also divided among themselves as there is a lot of confusion in their minds. I don't think so. Kerala society was not one where caste was a very big factor and it continues to be the same. To a large extent, this image is created by the media that is after sensationalism. I feel the Sabarimala issue will subside quickly. Once the temple closes, people will go back to their lives and the media will also get something else to sensationalise.